August 10, 1940 –The land beneath the First Regiment Armory at the northwest corner of Michigan Avenue and East Sixteenth Street is sold by the Estate of Marshall Field to the Standard Realty and Mortgage Company for an estimated $40,000. The sale is subject to a 99-year lease that Marshall Field made in 1890 with the First Infantry Armory Association at an annual ground rental of $4,000. The first armory was built on the property in 1893, but it burned down less than a year after it opened. It was replaced in 1894 at a cost of a half-million dollars, raised by popular subscription. After two decades of labor unrest, culminating with the Haymarket affair on May 4, 1886 in which people were killed when a bomb was thrown into the crowd, the wealthy residents of Chicago, many of whom lived south of Sixteenth Street on Indiana, Prairie and Calumet Avenues, began to take matters into their own hands. They opened their pocketbooks and forked over the cash to protect their homes. In 1886, just months after the Haymarket riot, land convenient to a direct rail line into the city on the North Shore was purchased, and Fort Sheridan was begun. 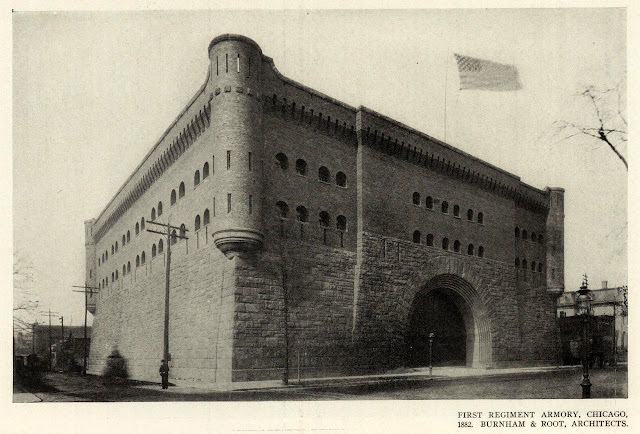 It is interesting to note that the First Regiment Armory with its thick stone walls, rounded turrets, and rifle embrasures, stood as a massive sentinel north of those wealthy homes. It is even more interesting to note that Marshall Field, himself, held a 99-year lease on the property. And you can bet with a fair amount of assurance on who stepped up for the majority of those subscriptions to build the armory. The subscriptions probably sold pretty darned quickly … the Pullman strike that idled 250,000 workers in 27 states and brought violence to Chicago had just concluded. August 10, 1882: The Chicago Daily Tribune reports that the city’s Health Office has reported 53 deaths during the preceding day, 30 of those being children under the age of five, 24 of that number being infants less than a year old. 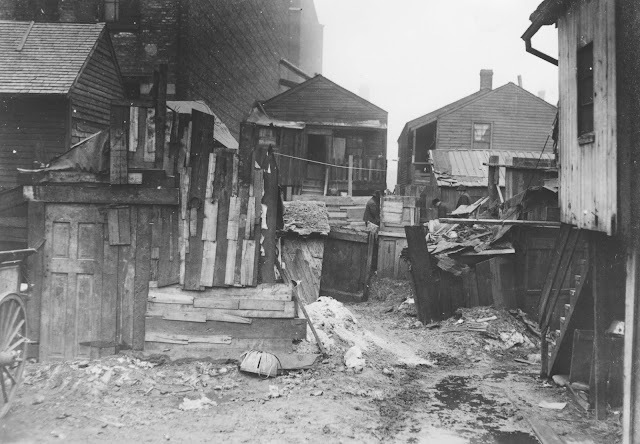 Of the two dozen babies who died, 16 of them succumbed to a disease known at the time as cholera infantum, a particularly pernicious disease that attacked infants primarily during the warm weather months, especially in large urban areas. Beginning around 1893 infant mortality, thankfully, began a sharp downward trend, most probably brought about by two important initiatives. First, the four-mile crib off Monroe Harbor was opened in 1891 and shoreline water intake was permanently ended. Research shows that the act of safeguarding the city’s drinking water lowered the city’s mortality rate between 1870 and 1925 somewhere between 35 and 56 percent. Secondly, the responsibility for monitoring milk distribution in the city was transferred from an independent body to the health department. Also in 1880 the Chicago City Council approved an ordinance that granted the city’s Health Department the right to inspect and regulate sanitary conditions in the work place and in tenement dwellings, an initiative that began to eliminate the unsanitary and unhealthful conditions in poorer areas of the city. August 10, 1918 -- It is difficult to believe today, but for years – over a decade – a swimming race was held that had athletes navigating a course in the lake before heading west up the river to Wells Street. On this day in 1918 Perry McGillivray of the Great Lakes training station wins the tenth annual river swim of the Illinois Athletic Club, establishing a new record for the two-mile course of 33:44. Miss Rebecca Wells of the Walton Athletic Club is allowed to participate, but she is not eligible for any of the prizes because women are officially barred from the event. In the 1912 Olympics McGillivray was a member of the American 4 X 200 meter freestyle relay team that won a silver medal. In 1920 he earned a gold medal as a member of the United States 4 X 200 meter relay team, also participating in the country’s water polo team as it earned a fourth-place finish. 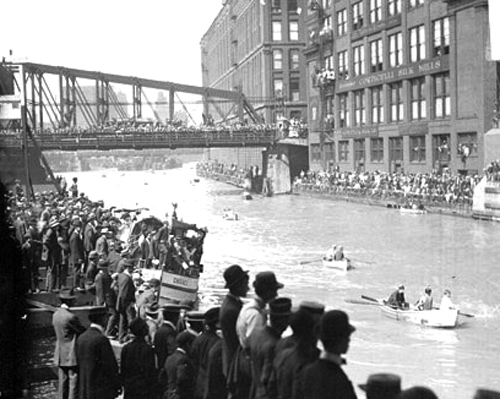 The old Chicago Daily News photo above shows the crowds lining the river as the 1909 race approaches Wells Street.